I posted the comparisons a while back, but now I'm finally ready to post the whole collection. Took me a while to get some good pictures of Space Cadet! Still not perfect, but better than my first try. Remember how much we all freaked out over the press release? They're different than I expected but they were in no way a let down for me- I freaking love this collection. Galaxy Girl. This one was so hard to capture but so beautiful in real life. It's a red-brown base with dominant teal blue flash which comes from these lovely glass-gleck like metallic particles and it has a complimentary dark pink flash at a different angle. There's even a little bit of purple and gold visible at certain angles. It's dark, which is awesome, dark duochromes are some of my favorite duochromes! And no frost! Yay! Halley's Comet. On a side note, my bottle of this reads "Halle's Comet" like Halle Berry but the name of this according to Orly is Halley's Comet... confusing but kinda funny! Anyway, if you've seen Zoya Charla or OPI Catch Me In Your Net, you've seen this. It has more green to it in real life but my camera likes to pull out the blue in it. Blue/turquoise foily glittery green duochrome mermaid polish. Totally gorgeous, would definitely recommend getting this if you don't already have the Zoya or OPI. It's Not Rocket Science. It's Rocket Surgery. Hehe. But seriously... super beautiful polish. Murky warm green with gold and yellow and blue sparkle and slight duochrome with a swampy green sheer base. Strange description but the end result is fantastic! Also, this is the most opaque of the recently-released similar colors and has more blue tone to it than the others. Lunar Eclipse. Extremely pretty rich blue sparkle with purple duochrome. Like Halley's Comet it is not unique, but despite being duplicated it's still gorgeous. Out Of This World. Are you drowning or waving? I just want you to save me... Should we try to get along? Just try to get along... A vampy blue-toned purple with glittery gold duochrome. Similar to Zoya Julieanne. Like the rest of the shades, I have nothing negative to say about this color, it's amazing even if it isn't unique. Space Cadet. I tried so many angles and so many different types of lighting to try to capture the awesomeness that is Space Cadet but I still feel like I failed to convey just how freakin' sweet this polish is. It's a glittery, sparkly, foily duochrome... And when I say 'duochrome' I really mean 'multichrome'... bad habit. But I don't feel like always counting how many colors they flash! This one is a purple base with dominant golden green duochrome. It has pink, it has orange, it has green and gold and yellow, it has purple and even a little blue. It's practially a rainbow of duochrome sparkle. Truly magnificent. I can't rave enough about this color, this is one of the best shades I've seen in my life and it's already made it into my favorite polishes of all time list. You have to see this in person to really enjoy how much it switches between colors. The formula on these was great. I'll admit I didn't have high hopes for it, but it exceeded my expectations. They're all opaque- three coats of each in these pictures-, they dry much more quickly than I'm used to for Orly and they went on pretty smoothly. Only a little runny. Other than that they were perfect. Not super three-free textured like I thought they might be. One of the best collections ever. I know a lot of people were disappointed that some of the colors are duplicates of other colors, but the way I see it... If you look at this as a whole collection, by itself, without comparing it to what's already been released, it's perfection. The only way I could improve on this collection would be to make six more shades like this. So in that sense, I'm not disappointed. But, since we are all polish junkies and we do follow the latest releases like hungry vultures, we have already seen some of these colors. It would be nice if every shade was completely unique, but the collection as a whole is undeniably awesome. I do have one complaint about the collection and it has nothing to do with the colors. It's the price. 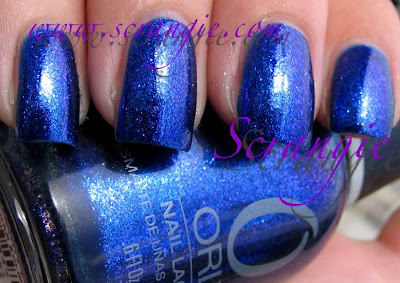 Orly raised the price of this collection to $10 per polish. Do I think they're worth the price? Yes and no. Yes because I've paid more than that for polishes not even half as cool. No because the other companies who released the exact same pigment type/polish type didn't raise the prices and they're just as good. 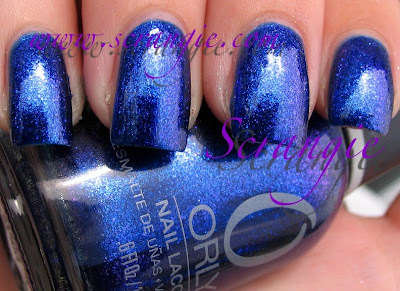 $10 is not very expensive when it comes to polish, but it is a little shocking to see from Orly which has traditionally been one of the lower-priced of the salon brands. We're seeing so much of this new glittery pigment lately. I wish they'd do more with it! It has the potential to make some really great colors from what I've seen in these. Get to work, polish companies! Don't just make redundant shades! I just got this collection yesterday. My TransDesign order came! I wasn't happy about paying $60 for this collection. But then again it was totally worth it. I put on Space Cadet immediately. OMG is it amazing! I couldn't get over all the colors that were flashing out at me. I love all of those polishes. It's a wonderful collection of polishes. Still not happy about the price! I'm so happy I had an American gf who works at Sally to grab this collection for me. I can't wait to receive it. See, after seeing some swatches and the disappointment of other bloggers, I thought I wouldn't love this collection - but I do. I'm feeling the same way as you on this, it's really fantastic. I think it's a bit of a surprise with the price hike, it's a bit of a shocker. I'd LOVE to see a hot hot pink done in the same finish, really. I think you did a good job with Space Cadet - I think I took eleventy billion pictures and posted a whopping five of them, trying to show it off. It's amazing. Love Space Cadet and Its Not Rocket Science. At first I wasn't going to get Its Not Rocket Science because I already have Zombie Zest...but now I don't know...I may need both!!! You know I'm not usually a fan of brown shades but I love Galaxy Girl, so amazing and gorgeous. I have Zoya Charla, but drool over Halley's Comet anyways. What else is like Lunar Eclipse? It looks stunning on you. Out of this World looks awesome, as does Space Cadet. I kept thinking Space Cadet might be similar to a color club color but the name is eluding me. gorgeous, Space Cadet jumped into the favorite polishes of all time too. It's the only polish I have ever bought a back up bottle of! I love it! Galaxy Girl and Space Cadet look gorgeous! I freakin' love Space Cadet! *singing* ...'so we move.We change by the speed of the choices that we make and the barriers are all self-made.That's so retrograde". I LOVE that song! I only purchased Space Cadet and Galaxy Girl,but I think I'm gonna buy Out Of This World too :) Thanks for showing these! 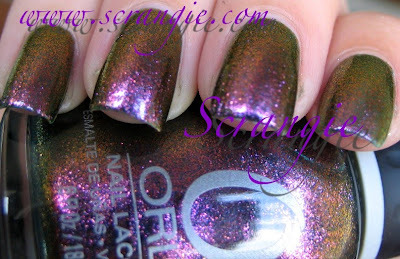 I really love this collection, despite the dupes I think Orly created a great collection. Galaxy Girl and Space Cadet rock! I echo phyrra's sentiment in not usually choosing 'brown' polishes but Galaxy Girl reminds me more of a bruise than a brown color. Which is by default awesome and amazing. It's hard to avoid feeling like a total badass when you are running around with what appears to be bruises on your fingertips. I freaking love this collection so hard. Just before it was released I was looking around my polish collection going "I don't need any more polish - definitely not buying more." And then this came out and three ended up in my possession! Should have made it four, but what are ya gonna do? Oh, Phyrra, about the mystery Color Club color, I thought that in the online swatches Space Cadet reminded me of the time I painted Wild and Willing over black. Is that the one you were thinking of too? Space Cadet is THE number one on my wish list... followed by Galixy girl. I can't wait to get my hands on these. What are the dupes? For Galaxy and Cadet, please. Space Cadet is a killer. I want it. I just got my hands on Space Cadet last night!!! I picked up Space Cadet yesterday! I wasn't too impressed with it when I put it on last night, but now that I've seen it in better lighting....I LOVE it! And now I'm also thinking of going back for Out of this World because I thought Zoya Julieanne was pretty. I'm contemplating Lunar Eclipse too. lol Bad influence Scrangie! I wasn't even interested in this collection before I saw the full display yesterday!! Galaxy Girl looks almost exactly like Urban Decay's Bruise, only with the same greeny/teal shimmer of China Glaze's Watermelon Rind. And I must be the only person in the world completely uninterested in Space Cadet, as I'm very cool toned. I am really hoping that I can find these up in Toronto! I only have two but I love love love them! SO mucch fun to look at. I knew I could only buy one at the time...tough decision. But I'm very happy with it. When I have a chance and the spending money, I'll pick up another. It IS a shame about the price. :( Bad, Orly, bad. I need more Orlys. 'Nuff said. I also had galaxy girl, but bought it for 10$ at Ulta and wasn't that crazy about it so returned it, the other ones i found at cvs for 6.99! which is how much all the orly there costs for some reason...i don't know why but i'm not going to question it. I had been waiting for them to get the display up checking back everyday, and finally tonight they had it, i'll probably go back soon and get the rest I just can't resist, or at least a back up bottle of space cadet...it's amazing. I can't begin to say how thankful I am for this site, it's my go to nail polish buying guide. We have very similar taste so I check your reviews and photos before i buy anything now. I have a rather random question. I absolutely love this collection but I'm located in Canada. I recently discovered a site called OrlyDivas and they ship to Canada. I was just wondering, would they be a safe site to order from? I didn't know anyone else to ask. OMG! I just did my nails in half-moon with Space Cadet at top color...It's Freakin! awesome!! Got Galaxy Girl along with Space Cadet. This was before I read this post....Now I definately want to get the rest of the collection. Spotted this display at CVS yesterday and now Rocket Science is on my fingers and Galaxy Girl is on my toes. I'm a nail polish newbie but these colors have birthed an addict!